This universal Equal Pressure Relief Cushion is a polymer gel that absorbs pressure through the use of walled gel chambers. These gel chambers are soft and supportive providing pressure redistribution through each layer of the cushion. This dynamic gel technology is ideal for light to heavyweight patients that are looking to offset painful pressure points in the treatment and prevention of bed sores and decubitus pressure ulcers. The unique polymer gel technology combines advanced pressure ulcer prevention and extraordinary comfort. The equal gel grid structure is both soft and supportive and it continually adjusts with every move. The Equal Pressure relief gel redistributes pressure with a patented dual layer structor called micro immersion technology to cradle and relieve pressure from bony areas. The Equal gel also maintains its structure and does not break down like normal gel cushions. The total gel structure is cooler than foam cushions reducing heat and moisture protecting and healing the skin. The all way stretch cover is removable and washable and is designed to prevent skin shearing and friction burns. 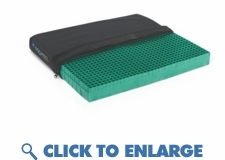 This adjustable gel cushion is a hit at nursing homes and hospitals. It is virtually maintenance free and easy to wash and rinse for patients that are incontinent. Unlike normal wheelchair gel cushions you just rinse the cushion directly under water with a mild detergent!